They can be golden/red, brown, black or grey in colour and some individuals can have a pattern of spots on their body. They have distinct black and white markings on their face and throat. 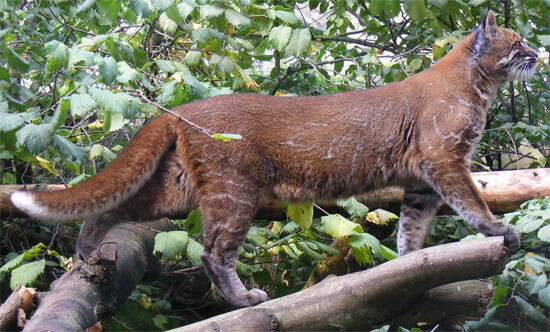 Asian Golden Cats are able to climb trees but they prefer to be on the ground. They have a range of vocalizations that they use to communicate which include purring, meowing, hissing and spitting. Asian Golden Cats can be found in the dry forests, tropical rainforests and occasionally open areas of south east Asia at elevations up to 3,000 m (9,840 ft). They are solitary animals and they mark their territory with urine, scratches and scent marks. Asian Golden Cats are carnivorous and they feed on small deer, large rodents, birds, amphibians, lizards and insects. After a gestation period of 75 - 80 days, Asian Golden Cats give birth to a litter of 1 - 4 kittens. At birth the kittens weigh approximately 250 g (8.8 oz) and they grow rapidly. Females reach sexual maturity at 18 - 24 months old and males at 2 years of age. Humans are predators of Asian Golden Cats.